The idea behind Matrix-Q Performing arts is that of its objective character, able to integrate conscious and subconscious, objective and subjective, structure and improvisation at the same time. 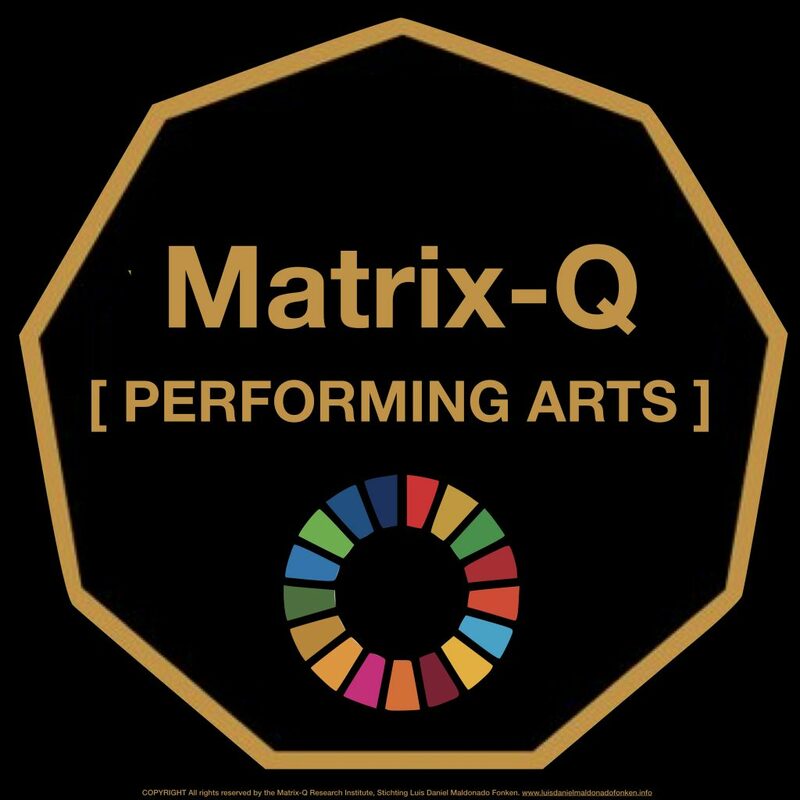 Matrix-Q Performing Arts algorithms have been developed based on the study of nature laws, principles, cycles, rhythms and human stages of development, human potential, the human factor; and nature inspired knowledge and technology of ancient cultures and civilizations. 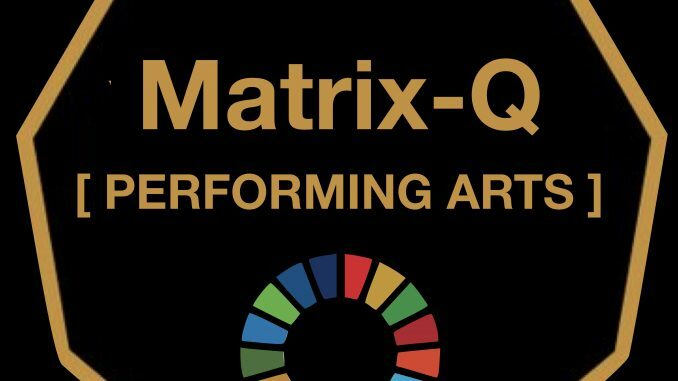 Matrix-Q Performing Arts & SDG Projects create a futurist bridge made of inspiration and creativity towards a global sustainable culture and civilization. In ancient times, there was no such a thing like internet, there were no news channels, radio or local newspapers. Kingdoms and civilizations found other pathways to communicate with and motivate their communities to collaborate with mayor decisions necessary for their survival or supremacy. The bards will tell stories, stories about ancient times, and mostly about the present. By representing reality with symbols, metaphors, bards will inspire people with ideas, create a bond within the communities, empower the culture with examples and memories. Bards, singers, story tellers, dancers, performers, will wear dance, clothe, costumes and design, use melody and color, sound and tone. While a choreography may represent the dance of the bees or the cycles of the moon, the seasons or the journey of the rain, other melodies and stories will talk about heroes, cultural values, heritage, family and love. Culture, community, family were empowered by story telling, dance and symbols. The wisdom of the great grandparents were told in stories, the values and courage of an hero which lived 1000 years ago was told in a dance, the seasons and the water cycle was experienced in a theater play, day and night, darkness and light, good and evil, divine and profane, sacred and science, were shared to those with ears and eyes, but the secrets stay for those with hearts. 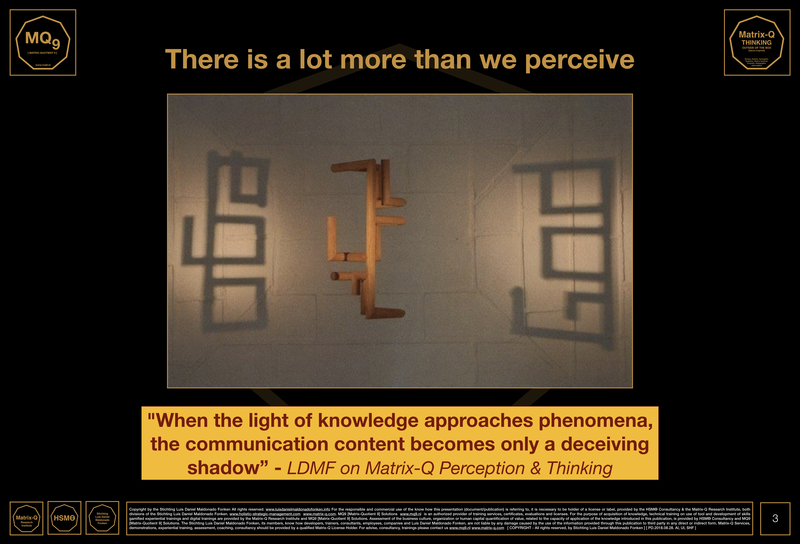 One of the main experiences of understanding i have several times achieved is that one of how knowledge and experience were communicated and that written language is not at all a mark of a highly advanced civilization but language is and there are several forms of language. In principle it is necessary to understand that any thing communicated may have more than one level of meaning and as for in written language, any other form of it may share more complex content. In that sense, i am pointing out, that researchers of history and culture, which did claim that language was a sign of evolution and civilization, did not have a complete understanding on human nature and its potential as we have today. While written language signs the active use of some cognitive skills, and ability of self-expression, there is no contradiction with the idea that a precise form of communication did exist in the past for which written words will not be necessary but other systems of structured communication. 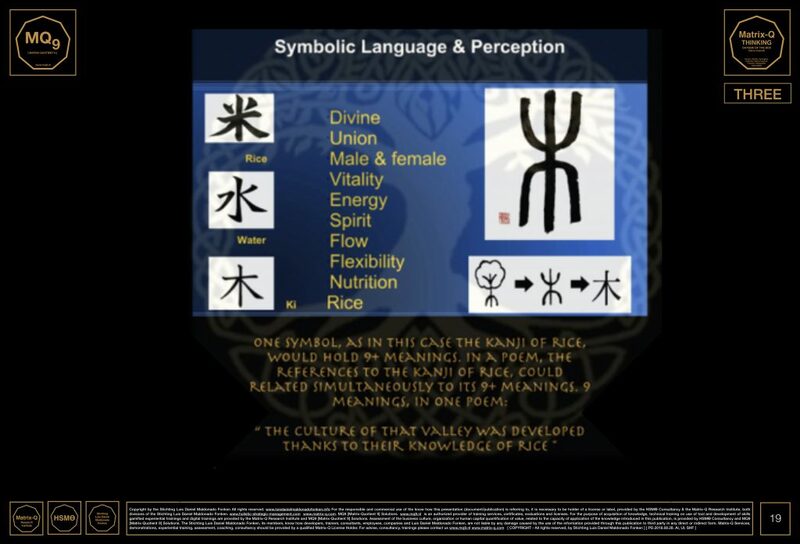 According to my research, this particular form of language, which involve geometry and sound is older and more ancient that the I Ching (Chinese), the Vedic, Celtic, Nordic, Egyptian, Greek or Persian forms of communication. In order to understand this form of language it would be necessary to study geometry, not only of nature but of the human body, (descriptive geometry) and realize that the Fibonacci series actually is a mathematical description of the proportions of life and cosmos, but also of sound. In my series of books on Matrix-Q Primordial Mathematics [ https://gum.co/xdhhe] i have described in detail how geometry and sound describe life and how through them an encoded language can be studied. An encoded language in which symbols and metaphors holds at least a matrix of 729 levels of meaning, or 9 perspectives for their understanding; a language in which the archetypes played did predict all forms of self-expression of human beings, from gender, sexual preferences, knowledge, love, capacity of collaboration, leadership, solving problems, society and culture. I did use the word engine as once it has been turned on, and its carried out by every individual within the clusters that have chosen to apply it, it will stay active generation after generation until it gets completely exhausted, or reach a limit of capacity of including events in the history of the culture that are dissonant with the C.G.E. design. While every time and then, in times of great confusion, a new hero will tell a story with own life, in order to bring back to awareness and wisdom to their land, by creating a new story, a legend and a myth. A hero that will play the archetypes of life, that are necessary for the current time. 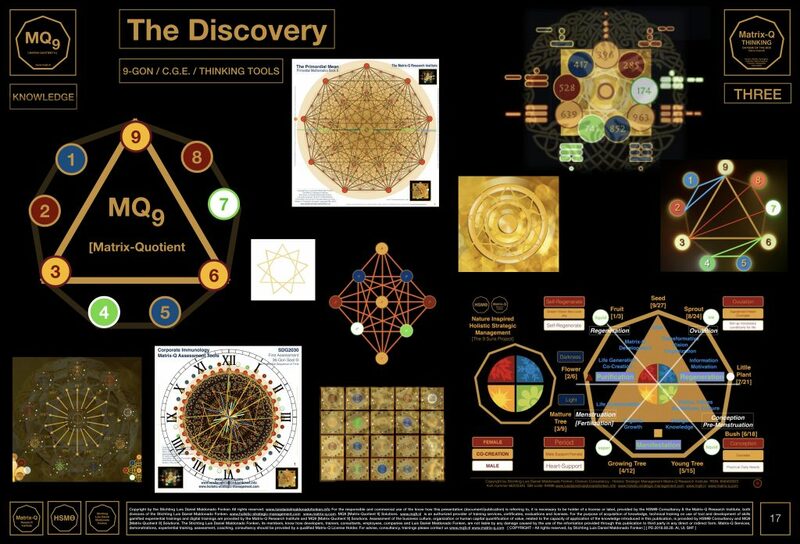 And it is in this way that the Matrix-Q Primordial Archetypes became part of my research and studies, described through mathematical, geometrical and sounding values, each of them expresses a potentiality of humanity, and its several possible stages of development. Probably mathematics, as description of proportions and relationship between form and function, was the very basic first language that helped humans study nature and its principles, laws, cycles and rhythms. Once nature has been understood, life and human and the universe or reality have been understood as well. 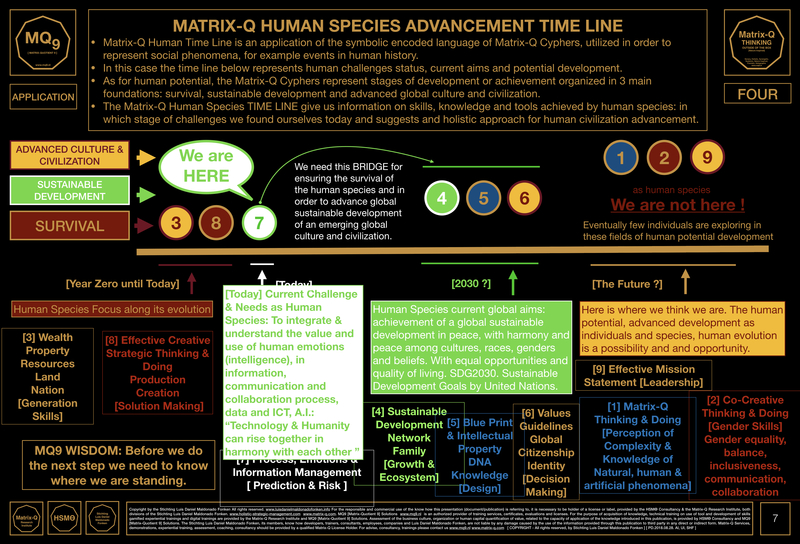 The Matrix-Q Primordial Archetypes as for their geometric, and sounding, mathematical nature, can be as well described through a series of cyphers. The Matrix-Q Tools for Effective Thinking help us for example organize the perception of phenomena in 9 classes or 9 cyphers. Adding structure to communication and message. But as well into 9 geometric and sounding values. Creating design, form, color, and sound for the content. In that sense a story can be told through dance, melody and play of the role of the archetypes, by following a series of steps [script] or cyphers. 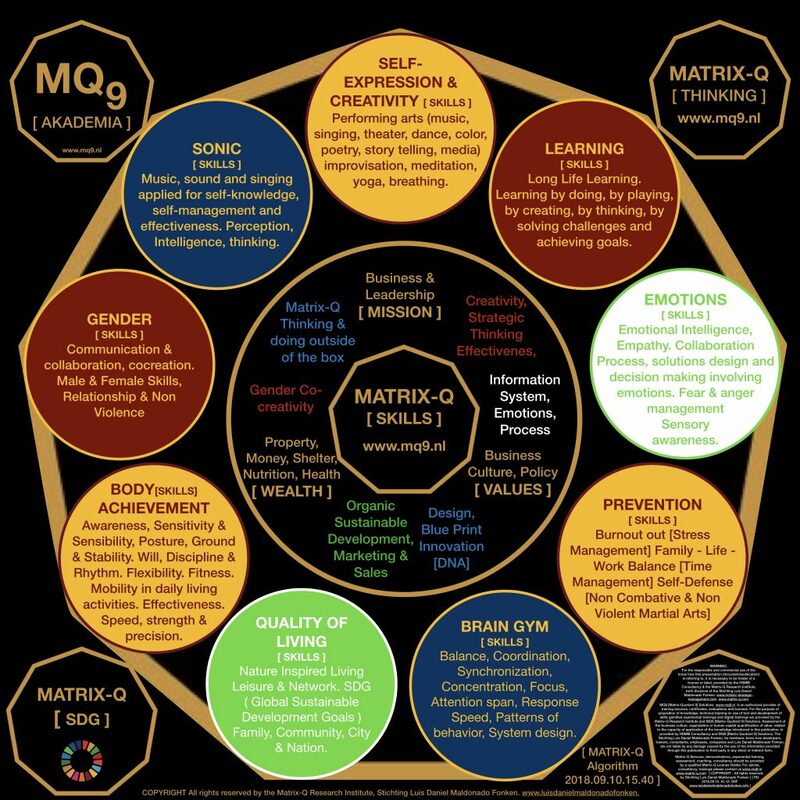 Martial arts, the art of flying (sky diving), the art of relationship and communication (love), the art of gardening, meditation, yoga and breathing techniques, combined with Matrix-Q Brain GYM and Matrix-Quotient of Intelligence Enhancement have been integrated to Matrix-Q Performing Arts. Between 2011 and 2015 i have dedicated a meaningful time into the praxis of story telling based on my study of bards of ancient cultures and civilizations. One of the archetypes i think i mostly appreciated in the history of story tellers is that one of the clown, the fool, telling to the kind the truth of the royal court, feelings , emotions and thoughts never told, as for the etiquette codes of behavior and communication; which were yet for the fool, as a fool, never observed. The Fool is the brother of the wise. Another important archetype in the history of bards is the Harlequin, which despite is obscure, mysterious and magical figure, humble and self-interested deeds, have played key roles in its advanced more complex version, as hermetic and mystic. The standard bard role is well known as for the poet and story teller, sometimes also singer, and theater role player, dancer and cirque character, which will tell a story not only by word, but by action. Stories are told in textiles, as modern research have understood on traditional textile design which represent choreographies of dances that were practiced by tribes and cultures. Stories are told in sculpture, as greek and roman arts would tell. Stories are told in architecture, as cultures of Persia, Egypt, China, India have told through their art. Stories are told by cultural customs and memories of heroes and challenges faced by them, their communities and nations. Matrix-Q Performing Arts focus on the art of communicating stories in all possible forms, but by utilizing sequence of secret encoded language, metaphors and symbols, which is nature inspired and legacy of ancient cultures and civilizations. As for my research in the cultures of Europe, Nordic Cultures, North Afrika, Middle East, Eurasia, and Asia, there has been one unique source of knowledge which has influenced culture by culture, civilization by civilization; which eventually its record and archives were gathered at the Library of Alexandria, destroyed later on, making of the unknown facts for modern researchers nothing else than legends and myths. The myth of the Proto-Culture, or primordial culture suggests that there has been one original or primordial source of knowledge. Which was communicated through wise people, generation after generation, and brought to the corners of the world, as for cultures to evolve with it and develop. If this theory is true, it also may be possible that it was already predicted one day humanity will expand its living territory in land and in numbers of people, and that one day a global culture will emerge out of exchange and interaction. In that moment in time, a new culture should evolve, capable to include all cultures, races and history of the world. In our modern times, we are experiencing this event, summit of the encounter and exchange between cultures and of the creativity combined of many nations. It may be even possible that the SDG2030, would serve as a global CGE, capable to guide humanity globally through the emerging process of development of a global sustainable culture and advanced civilization. But those are stories yet to become, to be told by our generations. Matrix-Q Performing Arts utilizes the concept of algorithms in this manner. An algorithm is a sequence of steps designed in order to solve a challenge. In our case, cyphers will be organized in a series of them which will create as a result a solution. For example in the Matrix-Q Time Line for the Human Evolution, the cyphers 387, combined, create the necessary conditions, skills, for survival. Without the cypher 3 (we mean all it represents, its content and meaning) nor soil, nor food, shelter or medicine would exist. The cypher 8 represent the human ability of creating, producing results, change and transformation, creation of tools and solutions for problems. Which has been since the wheel extremely important for what we known our modern civilizations. But the cypher 7 represents emotions, and information, which clearly is the challenge humanity is facing at the moment. The three combined would for example, as a set of knowledge, tools and skills, developed within the field of experience of all that has to do, be related or associated to the natural, artificial and human phenomena associated to the 3 cyphers: 387 make possible that a cluster of humans or community, along time, evolve in their arts, culture, technology and civilization. For example farming, industry and machinery, information and technology; while for our modern culture and civilization emotional intelligence have not been yet achieved. It has been part of our history, that rationalism took over and induced in the collective, by a mean of a method, the idea that emotions were detriment of human reasonable and civilized behavior. Intellectual thinking, and reasoning as a mean or skill for decision making in particular logic, were extremely valued and created the foundation for a civilization that isnt close enough for own emotions. A human dissociation, denial and rejection if not suppression of own emotional and subconscious self, which will eventually after generations of reason and logic into a series of human disease produced by the repression of feelings, emotions, associated to experienced of life, traumas never healed properly, as the emotions involved were never acknowledge. For example that type of condition, now common to be found in the modern culture, find its parents into logic and reason, over instinct, feelings, sensations and emotion. 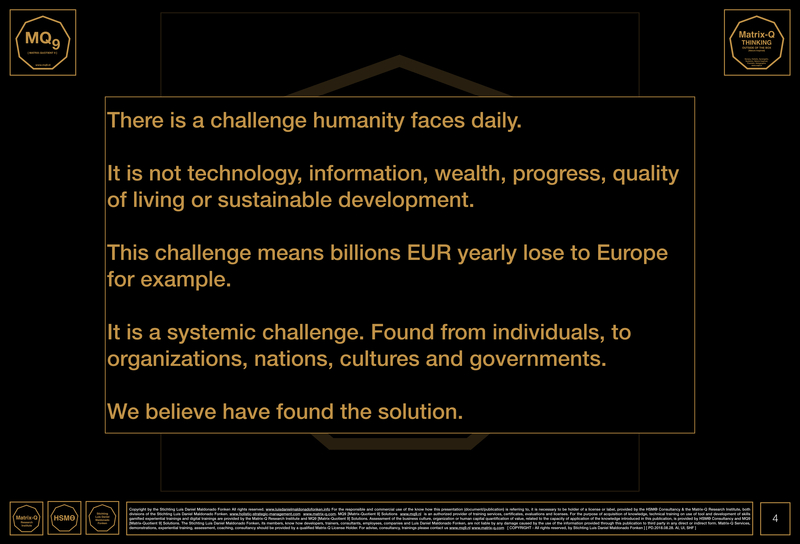 A great challenge is waiting for humanity, in the field of phenomena of the cypher 7. 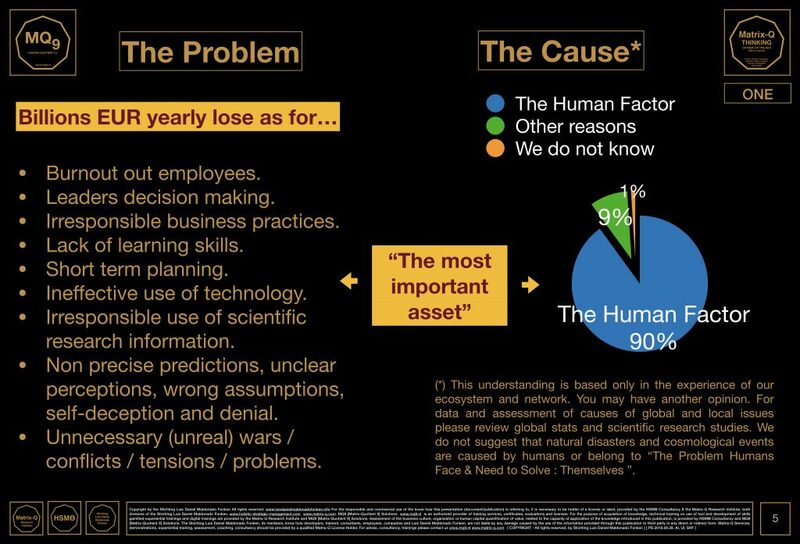 Once we realize that data for the modern technology necessary to be generated, must pass through human perception, at one or any stage of its generation, which as we know is condition by memory, culture, emotion, the subconscious world, fear and anger, imprinted in the mind, body and soul of the humans involve into data assessment, generation, design and organization. The Mastery of human perception is next to the mastery of human emotions is probably the most crucial achievement humanity needs to do, in order to bring its self as a species, globally, to a new form of civilization. 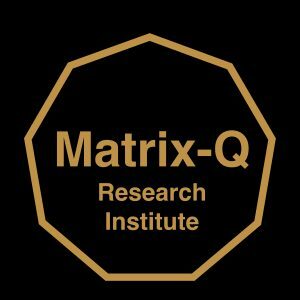 At the Matrix-Q Research Institute i am aiming these years to gather multidisciplinary minds, hearts and hands able to design the series of cyphers, algorithms, necessary for an evolutionary change of human kind, and capable to innovate in the generation of tools, skills, knowledge necessary for the process of global change. Global change means to collaborate with humanity along its history, nowadays, as suggested by the United Nations in 2015, by a common effort towards the achievement of 17 global sustainable development goals, which will upgrade the quality of living, progress, wealth generation ability, legacy, heritage and culture globally. What can be better than the legacy of a world in peace, and happiness, for future generations. 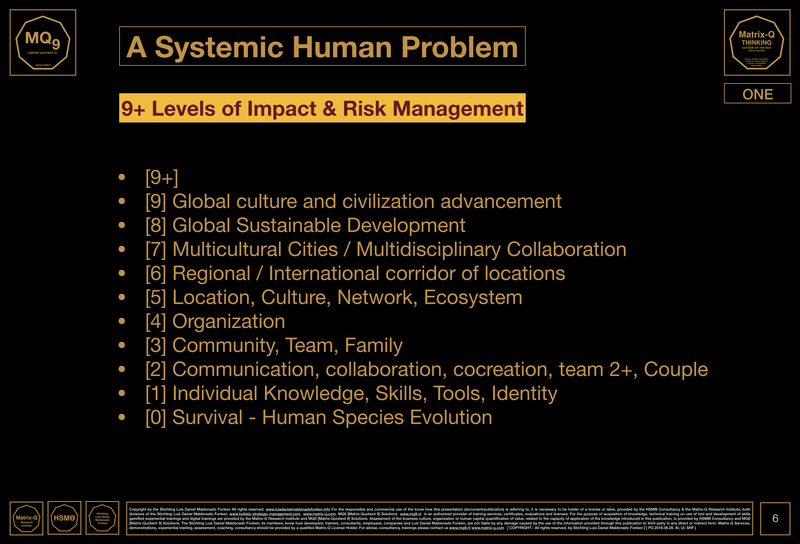 I am certain, that the systemic change achieved through the development of emotional intelligence skills, the mastery of perception and integration of both knowledge into tools, technology, will advance human effectiveness, leadership for sustainable development, with such precision, in all levels of risk, impact and change necessary. While i have wondered if yet the publication of books and share of data, description of knowledge and technology, would be enough. Now that media, in digital form is able to reach every human around the world, or at least to make knowledge, technology, skills, tools available world wide, if not to every one, to some that have the chance to make the choice of sharing it with their own locations and cultures. I have wondered if the digital communication is enough. I arrived to the conclusion that it is, as for information. But as well that information and encoding isnt enough for human hearts and lives. Back to the roots of my research in nature inspired knowledge and technology of ancient cultures and civilizations, and the language utilized for its communication, as for music, design, arts, stories and performance, i find that math without form and sound would be to abstract for the hearts, yet a dance and a theater play may create a memory and a story that can be told millions of times. The Matrix-Q Primordial Arts, utilize the knowledge introduced above, the ability of design of algorithms, series of cyphers organized according to nature inspired knowledge. These cyphers hold meta-content in their language, archetypes and symbols, metaphors, that can be utilized to create, arts! and arts are the foundation of culture. I can imagine how through arts the current needs of change, as for SDG2030, global sustainable development goals, can be communicated, how the solutions and values transferred, how the hearts can be inspired, the minds made aware and the hands empowered, for creation. In that sense the Matrix-Q Research Institute is activating one of its most valuable projects in the Netherlands, a gathering of artists, creative minds, hearts and hands, able to communicate SDG, inspire and empower leaders, organizations and families to turn their hearts and eyes to humanities legacy, as for our own planet, for future generations. A leap of faith, that all the tribes of the world, the cultures of ancient times, their elders and their children, have empowered with their spirit, with their stories, the nations and leaders of our time, to take a step forward for peace and life care, by deciding together to collaborate towards the survival of our planet and a better legacy for future generations, through the SDG2030 Sustainable Development Goals. In order to join us, you just need to be ready to communicate and co-create with us, and create a story that will be told, as a role player in our time of change.